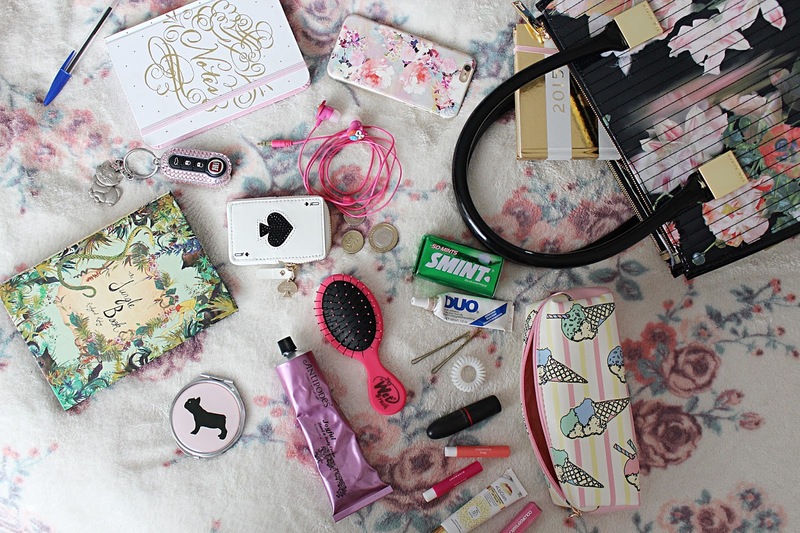 Ever since my beautiful Ted Baker bag entered my life, I've been wanting to do a 'What's in my bag?' post. I know they're extremely old-school nowadays, but they're one of my favourite blog posts to read (me so nosey) and I thought it was the perfect opportunity to give my handbag a reshuffle. I'm currently on the hunt for a new wallet, after my last one sadly died a death, so in the mean time I'm just using my ADORABLE Kate Spade coin purse to keep my pennies in. I bought this a few months ago in the sale, after missing out on the red heart one (sob) and checking daily to see if it came back in. It's such a cute playing card shape and it's officially got me feeling the Kate Spade hype 100%. My makeup bag is a sweet little stripy/ice cream pastel affair from Primark, that fits just the right amount of day-to-day goodies in - my Duo lash glue, some kirby grips and my fave Invisibobble*, a lipstick, lipgloss, a couple of mini perfumes, a mirror and my current favourite lip balm by LipGlam* (this stuff does it all, seriously). I always get dry hands so I keep a hand cream in my bag at all times too - my current favourite is Antipodes Joyful Hand and Body Cream*. I usually have some hand sanitiser on me too but it appears I've run out (cue mad dash to Boots tomorrow to stock up). 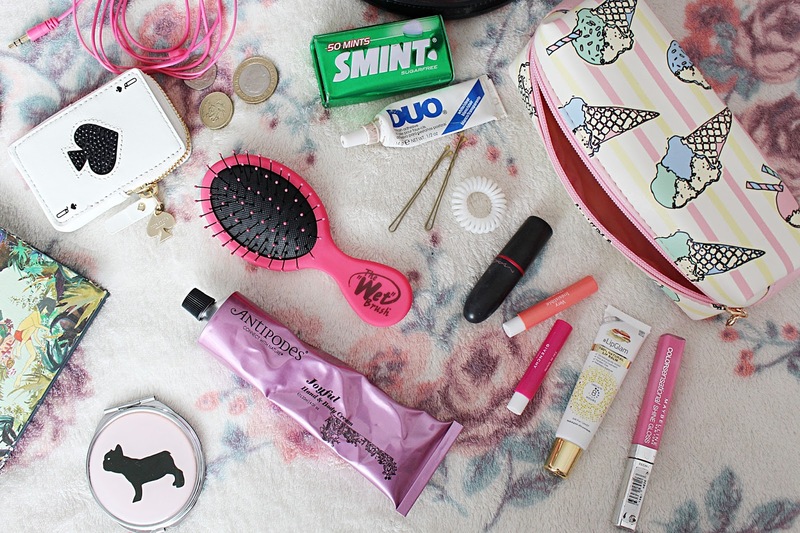 As my hair is always a mess, I have to keep my mini Wet Brush* on me (best thing ever) to keep my tresses in check, along with some mints, my iPhone and some snazzy owl headphones. I also carry my blingtastic car keys, 2015 diary, a notebook and pen for jotting ideas down, and my favourite thing ever - my Kindle, which is packed full of my favourite reads and I keep nice and protected in my beloved Jungle Book Kindle case. So there you have it - everything that is currently living in my bag. Bar, you know, the occasional chocolate bar, receipt and vouchers I'll probably never use. I didn't think they were glam enough to make the cut.